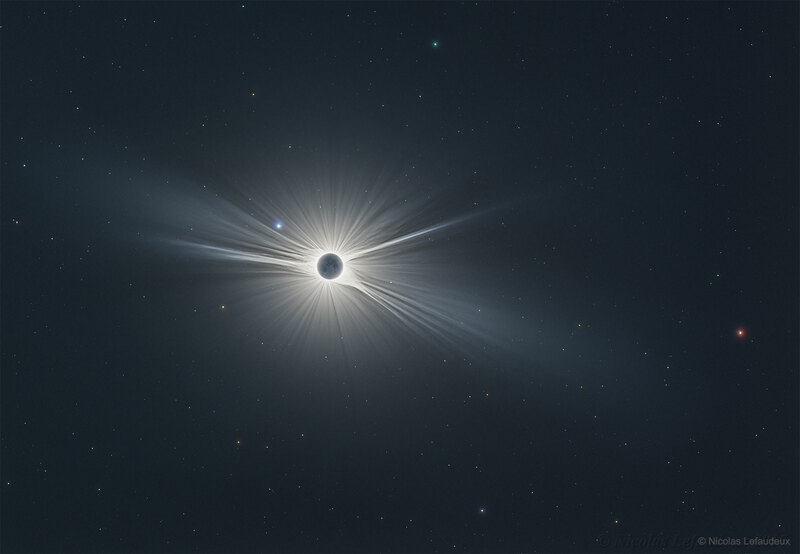 Explanation: Only in the fleeting darkness of a total solar eclipse is the light of the solar corona easily visible. Normally overwhelmed by the bright solar disk, the expansive corona, the sun's outer atmosphere, is an alluring sight. But the subtle details and extreme ranges in the corona's brightness, although discernible to the eye, are notoriously difficult to photograph. Pictured here, however, using over 120 images and meticulous digital processing, is a detailed wide-angle image of the Sun's corona taken during the Great American Eclipse in 2017 August. Clearly visible are intricate layers and glowing caustics of an ever changing mixture of hot gas and magnetic fields. Hundreds of stars as faint as 11th magnitude are visible behind the Moon and Sun, with Mars appearing in red on the far right. The next total eclipse of the Sun will occur on July 2 and be visible during sunset from a thin swath across Chile and Argentina.